Very Professional , Will definitely get you results ! I joined Fitness Stop about 2 months ago, and I must say it has been a good decision. My goals were to get in shape, and lose some weight. A healthier lifestyle is a great byproduct of all these efforts. My diet has always been clean, but i hated going to the gym. Enter Garid, and Fitness Stop, I now love working out 🙂 I’ve trained with Garid, and he is been amazing!! All of my training sessions have always been different, and never boring. He has pushed me further than I would ever push myself. You know you are making progress when you can endure more weights, or more strenuous cardio than what you could do some time ago. With Garid, I’m slowly but steadily seeing results like these. They are a little bit on the pricier side, but consider it a very good investment in your own self. I highly recommend Fitness Stop to anyone who is looking to lose weight, get in shape, or just looking for a better, healthier lifestyle !! “I have always been reluctant to get a personal trainer because I thought I could do it myself; not to mention it was very costly. After months of frustration not seeing the results I expected, I decided to post on Thumbtack to get pricing for personal training. I received multiple calls and emails from various trainers in the area. Robert, from Fitness Stop, called with detailed information about his weight loss and strength training plan. Because of the information he provided, and I can assure you the other trainers did not give me this information, I was convinced I needed to meet with him for an initial assessment. After 6 weeks of following his plan, I’ve lost a little over 4% body fat and gained lean muscle mass. Not only do I feel healthier and more energetic, I’ve lost weight and inches! I’ve worked with majority of their trainers, and they are all amazing! Each workout is different to prevent your body from hitting a plateau. Not only that, but it breaks of the monotony of the average mundane workout. I would 110% recommend Fitness Stop for not only weight loss but overall improvement of health. 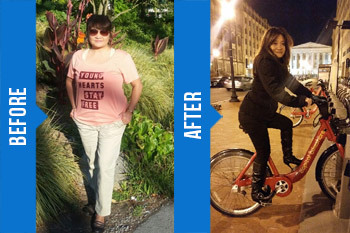 “I wanted to write you about my AMAZING experience that I have at Fitness Stop in Falls Church, Virginia. I have been training with them since February and I can’t believe what a transformation it has made, both physically and mentally. I continuously receive compliments about my weight loss which consequently has lead to my self esteem soaring. I owe all this to the trainers at Fitness Stop’s great attitude, professionalism, and caring for their clients. My goals are steadily being met. I feel so much lighter and stronger than I have in a long time. I recommend Fitness Stop to anyone of any age group who is trying to lose weight, regardless the amount, and to those who just need get physically stronger to be at their healthiest. Take my word, it is worth it. You are worth it. “and I thought I was fit! When I joined FitnessStop I realized what training really means and how you can beat your personal fitness level. Instructors are skilled, supportive and push you beyond your personal comfort zone. Workouts are always different – one day a week it’s boxing! Camaraderie and team work make each session fun and even more challenging! Excellent program with an excellent staff. These guys know what they’re doing and are very serious and dedicated to getting you the results you’re looking for. You don’t have a gym to work out of? No worries they have their own facility. I highly recommend signing up. Fitness stop is a great environment for those who really want to improve their fitness. Every work out is different so you never get bored! I have received many compliments from family and friends about how great I look! I definitely recommend this to all who really want to challenge themselves physically! Robert is an excellent for for my 16 year old son. He is professional and invested in the success of the whole person. He cares about nutrition, physical health and attitude and pushes my son to achieve more and grow. I’d definitely recommend him as a trainer. Excellent trainers-know the ins and outs of fitness! I have been training with Robert Armstrong (Fitness Stop LLC), Personal Training, 4 times a week since November 18, 2015. I researched numerous fitness programs and met various personal trainers in my local area before choosing Fitness Stop LLC. I found an immediate connection with Robert and his training program as I felt he truly cares in working with his clients to reach their fitness goals regardless if its 10 or 60 pounds. His personal experience in weight loss and dedicated training drives his clients to achieving their fitness goals as he has. My goal is to lose 25-30 pounds within 6 months from the start of my training. Robert provided me with a meal plan that I have been disciplined in following. He prepared me to understand the challenges I will experience when changing to a healthier lifestyle with consistent exercise and diet. Robert has the patience yet pushes his clients to the level he knows they can achieve and they do. He works well with clients with injuries as well. In the first 3 weeks I trained with Robert, I lost 10 pounds. I definitely met my goal in losing the most difficult 10 pounds in less than the time I expected and because of it, I am more motivated and determined and will continue training with Robert. Losing pounds and maintaining the weight loss was always the most difficult for me but because Robert’s training varies and not boring, I look forward to each training session and always feel accomplished after. The only regret I have is that I wish I had started sooner with Robert Armstrong and Fitness Stop LLC but like anything in life, better late than never. He is especially good with middle school/high school age kids who want to improve their athletic performance or begin a weight lifting regimen. Of the 5 boys in my 15 year old’s work out group — 3 are committed to college programs and 1 is playing D3 football. A fourth just earned best football work ethic award for his high school. Thanks Thumbtack for getting me connected to Fitness Stop and their trainer Garid. In the two months that I’ve been training with him, I’ve gained muscle mass, strength and endurance, lost weight and feel great. I have a very bad lumbar problem. Garid’s skeletal and muscular systems knowledge and carefully-executed exercises have eliminated my back pain and improved my posture. I am amazed. These results were after only two months of “Garid sessions” twice a week and weekly Saturday cardio sessions with Robert. Garid is a great person, very professional, reliable, and cares about his clients. I highly recommend him and Fitness Stop and have already referred them to someone who will start working with Garid next week. Fitness Stop is an excellent workout studio with the highest quality trainers and equipment. The emphasis on high intensity interval training and personalizing fitness regimens to meet individual goals means clients get results fast. After meeting with Robert and agreeing with his fitness philosophy, I started training with one of the trainers, Garid, twice a week for 45 minutes each session. Garid immediately understood what I was trying to accomplish in terms of strengthening, toning, and weight loss. Each time we meet, he crafts an intense workout session to help me meet my goals in a fun, energetic environment. I leave each time wanting to come back for more. Robert is such an amazing trainer. I worked with him for only two months, yet I’ve seen an incredible results. He brings a fantastic personal enthusiasm, energy and a great sense of humor with him to every session. His friendly and easy-going personality create comfortable, relaxed –although challenging- atmosphere. Because of his great effort I am now more stronger and healthier. He makes working-out sound like a very fun idea. I recommend him without any hesitation. “It’s my first time trying personal training and I could not be happier! Robert is more than just a trainer; he is a coach pushing you each step of the way and motivates you to do your best. Personally for me, the goal was to lose weight and get in better shape, but definitely got way more than I expected. I am still in process of reaching my target (to lose 10 more pounds; already lost 10 pounds in first 2 month) but I already see results in my lifestyle and feel stronger, healthier AND happier. The training sessions are not easy, but Robert makes the whole process fun and I always look forward to challenging myself with something new. “I have had the pleasure of working out with Fitness Stop trainers over the past 10 weeks. I always feel very accomplished whether my session is 1-on-1 or with a small group. Robert’s week to week accommodations of my changing work schedule have afforded me the opportunity to stay on track. Without question, Atlantris will whip you into shape and help you reach your goals, be they fitness, nutrition, and/or weight loss. No doubt, this 2015 “self-investment” has certainly been worth it! “So, I’m an older guy, seventy-six to be specific. I’ve been exercising for a very long time; but age is age. I’m a cardiologist and still very active in private practice. I know a bit about the things all of us try to improve during our exercise sessions. Major problems that can occur with aging include joints and balance. Robert is extremely observant focusing on strengthening muscle groups that will improve abnormalities in gait and posture; although the client may think he or she has been exercising correctly. He will push you, as he is supposed to. Knowing your sports interests, he can direct you to those exercises that may enhance your stamina and thus performance. We continue to work together. He is timely. “Robert was great! I’ve had personal trainers before but he’s the only one that did a real assessment ahead of working out. This way he was able to tell me very specifically where I’d need to put in the most work to reach my goals. “He’s a professional personal trainer. I’ve been working with him for a while and I loss about 12 pounds in short time. WANT TO WRITE A REVIEW FOR FITNESS STOP LLC?